An autonomous region of Portugal, Madeira is an archipelago in the Atlantic. It has two populated islands, Madeira and Porto Santo, and a few smaller and uninhabited islands. The region is sometimes called the Island of Eternal Spring for its mild weather, but it is most known for Madeira wine, the fortified wine produced by the hundreds of vineyards on the island. Though closer to Africa than to Europe, Madeira has a distinctive European colonial flavour. The capital city of Funchal on Madeira Island has traditional narrow, cobblestoned streets lined with shops offering embroidery and wickerwork. But it also has many big shopping centres. Madeira Island is volcanic and mountainous, and is home to the largest evergreen forest in the world, the Laurisilva Forest in Madeira Natural Park. The island's winters are mild. Madeira's beaches are quite different from the others in Portugal, stony rather than sandy, but there are good surfing beaches on the island's southwest. Scuba-diving is a favourite activity on the Garajau coastline, which has one of Europe's first underwater nature reserves. The pristine beauty of Porto Santo's beaches, however, is in a whole different league. The white sands and clear, calm expanse of aquamarine waters are a tempting setting for this favourite holiday destination. It also offers good property investment opportunities, although the construction of hotels and golf courses in the last five years has robbed the once-quiet island of its past serenity. Madeira provides a laid-back and high-quality lifestyle. The crime rates are extremely low. The culture is very European. 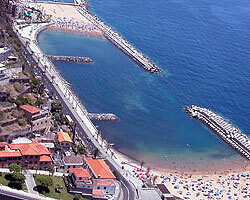 Portuguese is the official language, although English is widely spoken (particularly in Funchal). Native Madeirans are friendly and helpful, and the cost of living is lower than that in continental Europe. Healthcare and education are also very good, as there are several private medical centres and international schools. But property is quite expensive. There are only a limited number of properties on the market in the islands, which makes demand higher and prices rise accordingly.